Steven Whittaker has revealed he hopes to end his playing days at Hibs, claiming the ties which bind him to Easter Road were too strong to resist the chance to return to the club. The 33-year-old admitted he had offers from others after his release from English Championship outfit Norwich City made him a free agent, but his memories of making his breakthrough in a green-and-white shirt and winning the CIS Insurance Cup ten years ago made it easy to reject them. 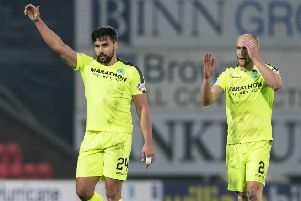 Whittaker’s name had been linked with Hibs for a number of weeks, the speculation finally brought to an end as he put pen to paper on a three-year deal but the former Scotland internationalist insisted there was never any doubt as to where he’d be going. He said: “It actually didn’t take that long. It was a matter of me wanting to focus on what the next stage of my career was. I had never been in this position before and I wanted to enjoy time with my family. Capital rivals Hearts were credited with an interest in Whittaker but while insisting he “didn’t want to talk about other people’s business”, Whittaker said: “There were other approaches made and I had a couple of options down south but when I knew I was coming back and Hibs were interested, there was no getting away from my ties with the club, coming through here and having that platform to be a professional, all the good feelings you have when you make it. Asked if he’d had any reservations at returning to the club where he was part of that fondly remembered “golden generation” which included Scott Brown, Kevin Thomson, Garry O’Connor, Derek Riordan and Steven Fletcher, he said: “It was a long time ago. Hibs’ second Premiership fixture is Rangers at Ibrox and Whittaker, who left the Glasgow club along with others after it was liquidated, admitted it was the first he had looked for. He said: “Whatever reception I get I won’t let it bother me. I’m 33 now so I’ve experienced all the different ones, whether you’re cheered or booed. That’s part of football and you just have to get on with it. But he insisted: “Everyone has a different opinion of what happened and who was to blame for what. As players we were paid to play football. It was difficult at times but that’s all we knew, that was the be all and end all.